Many river-front property owners are beginning to understand the important role a shoreline plays in the health of a river system. Wetland grasses provide habitat for birds and aquatic creatures, while taking up harmful pollutants that threaten to enter our river’s waters. 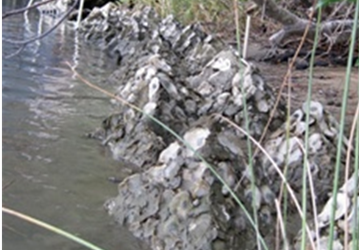 Marsh sills and rock revetments are hydro-dynamically designed to reduce wave energy and trap harmful sediments that can block out the sunlight for aquatic grasses and smother the critical benthic population struggling to inhabit our river’s bottom. The Ready Reef design is not always a perfect substitute for a marsh sill or a revetment, and there are several considerations such as salinity and water quality that will need to be examined, but the concept is very intriguing. Not only are these structures trapping pollutants at the river’s edge, but also each adult oyster is filtering up to 60 gallons of water per day. The bulkheads that were once considered the standard stabilization mechanisms for our shorelines have performed the reverse function, often allowing pollutants to flow, unchecked, into the river system. Ready Reef doesn’t ignore concern about parasites and diseases that decimated the oyster populations in the Chesapeake Bay decades ago. To combat these reef killers, Ready Reef has a two-fold plan: Oyster spat doesn’t leave the Ready Reef upweller until there is clear evidence of a healthy strike and the structures that the spat are placed on are specially designed to keep the reef higher in the water column and away from the diseases and parasites that are more prevalent at the sediment-smothered bottom. For more information about river friendly ways to stabilize your shoreline contact River Steward, Richard Moncure at Richard.moncure@riverfriends.org.